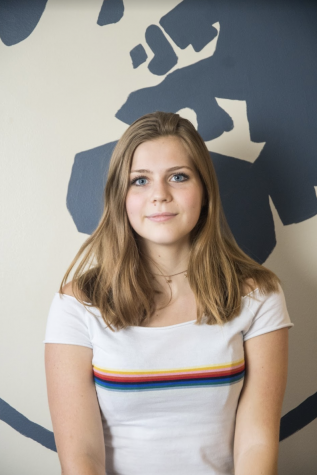 Lise is in 12th grade, and this is her fourth year on the staff and she has been a page editor for 3 years and a writer for Globe for 4 years. She joined Globe because she loves writing and wanted to get more involved with school activities. What excites her most about journalism is getting more information about things going on recently around St. Louis and getting to write about them. Her favorite kinds of stories to write are reviews. Last year, she loved writing reviews on movies and restaurants but she is trying to explore the sports section more because her goal is to interview more and get to know more people. Along with Globe, she also loves to be part of the swim team and she plays water polo. She has two brothers, who can be annoying but mostly manageable, and her parents who love her a lot. She also has two dogs and she originally comes from Netherlands, she moved here about 8 years ago.